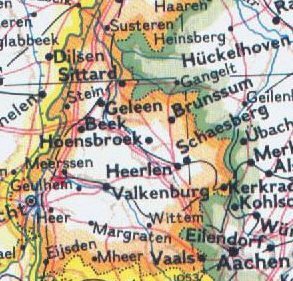 You can't tell by this map but that area is bordered on right by Germany and on the left by Belgium. My daddy used to be able to bicycle to either country very easily. He often went to Belgium because that is where his mother was from so he, and I, have several relatives there. In the map below I've included the town of Nijmegen to show where it is because of the disagreement over the photograph in the Limburgs Dagblad as to whether it was taken in Nijmegen or Meerssen.